Confessions of an eBay Bride » Blog Archive » Bridal Blowout Season is upon us! « Who Does the I Dos? Bridal Blowout Season is upon us! It’s that time of year again: the Christmas trees and tinsel comes down and brides everywhere start girding their loins & donning their sturdy shoes for the full contact sport that is Bridal Boutique Sale Season. 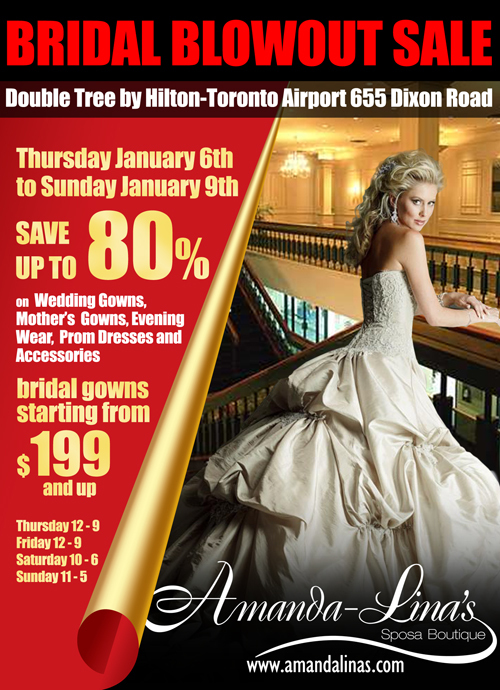 More than just the bog standard trunk sale, a bridal blowout (usually held at a hotel or events centre due to their sheer size) sale is ideal for the bride who’s willing to fight for an affordable dress. And when price tags can creep upwards of the 2-grand mark, it’s worth looking into attending if you have an idea in mind for your dress to end all dresses. With prices that start at $199, it’s certainly worth a shot. Amanda Lina’s annal event starts tomorrow (Thursday, Jan. 6) and runs until Sunday (Jan. 9). I attended this sale a few years back when one of my BFFs was getting ready to say her I Dos. And, though she didn’t find her dream dress there, there were plenty of happy ladies who did. This entry was posted on Wednesday, January 5th, 2011 at 11:56 am	and is filed under Finding Fabulous, Über Bargains. You can follow any responses to this entry through the RSS 2.0 feed. You can leave a response, or trackback from your own site.